This wood product is covered by a limited 5 years manufacturer warranty for standard residential use from the original date of receipt. Warranty covers the quality of the construction and material and does not extend to misuse, exposure to chemicals/liquids or improper maintenance. Changes in the wood resulting from exposure to direct sunlight and extreme temperatures are not covered. Highly figured veneers are derived from areas where the tree grows in different directions, causing tension and pulling on the fibers in the wood, which can result in hairline cracks. This is considered an enhancement of the wood and is not covered under warranty. This upholstered item is covered by a 5 year warranty on the original upholstered cover for normal, non-commercial use from the receipt date. Resale, commercial/institutional use and recovering the frame void all warranties. This warranty does not cover damages resulting from misuse, accidents, improper cleaning or accidents. Due to craftsmanship and natural materials, slight variations may occur from piece to piece and are not covered by warranty. Wearing quality, washed fabrics, colorfastness, shrinkage, wrinkling and stretching of fabrics are not covered. Usage of fabric protectors will void all warranty. To protect wood furniture, avoid exposure to extreme temperatures, direct sunlight and humid conditions. Do not place near heat sources or open windows. Plastic, rubber and hot objects can cause markings on a wood finish. Do not place objects directly on the surface, we suggest placing a strip of leather, cork or felt underneath accessories. For everyday cleaning, dust with a soft, clean cloth and wipe with the wood grain. You may dampen the cloth with furniture dusting aid or furniture care polish following the manufacturer's instructions. Wipe spilled liquids from the surface immediately with a lightly dampened cloth with the grain. For a more thorough wood cleaning, wash with a mild wood soap. Following the manufacturer's directions, use a soft cloth and wipe with the grain. Occasional polishing with a high quality, non-silicone furniture polish will enhance the beauty of the piece; avoid waxes or oily polishes. Scratches can be treated with scratch remover or furniture touch up sticks. To keep your upholstery in the best condition we suggest simple maintenance, careful cleaning and practical precautions. Place your upholstery properly; avoid placing fabric and leather furniture near heat sources and direct sunlight. Reverse cushions and pillows on a regular basis to keep filling distributed evenly and minimize wrinkles from regular use. Vacuum your upholstered furniture regularly so dust and debris do not become embedded in the fabric. To clean upholstery, use a professional cleaning service whenever possible. Test cleaning products and techniques on an inconspicuous area before a thorough cleaning. Full of soft grey, ivory and nickel, the Gretta Series is modern and tailored. Simple silhouettes, neutral tones and refined details allow the series to blend seamlessly with a variety of interior styles. Pick and choose within the Gretta Series for a complete, cohesive look that eschews matchy - matchy in favor of thoughtful, sophisticated pairings. Gretta's bright, clean finishes combine effortlessly, adding polish and distinctive style. Simplicity is so chic! 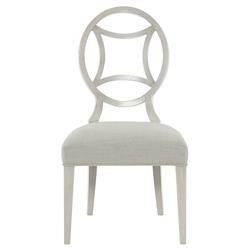 The soft grey, monochromatic palette of this side chair is layered and versatile. The textural upholstery contrasts the sleek wood finish on the frame. A medallion, double ring design on the back creates a beautiful and distinctive silhouette. Elevate your favorite space with one of our favorite chairs.